Last week I awoke from my long winter nap and opened my 2012 racing season with A debut at Southern Cross. Both the final race in the 2011 and the opener for the 2012 American Ultracross Series, this race is worth double points. Southern Cross is promoted by Eddie and Namrita O’Dea, the duo behind the Fools Gold 100 mile mountain bike race, this year’s NUE final. Never having raced in February smack in the middle of a long base training period, I am both curious and nervous about how my body will respond to race level efforts this early. 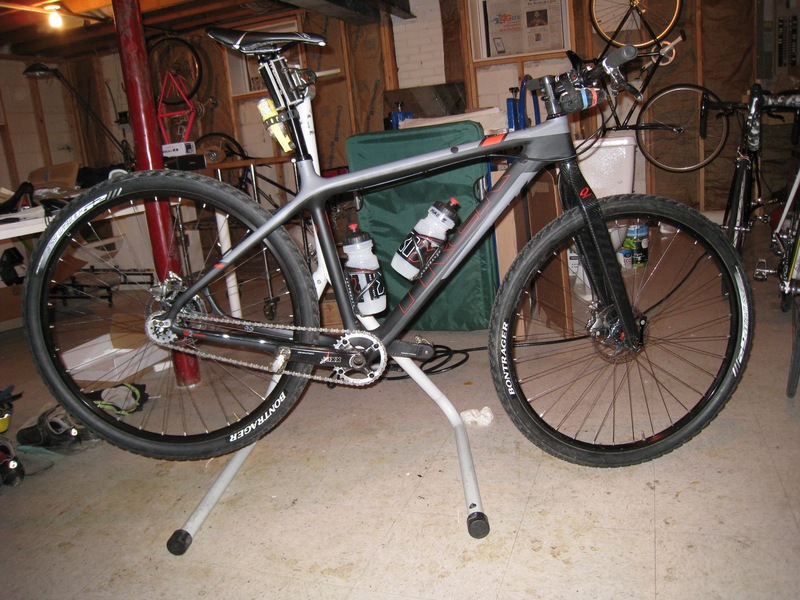 I’m riding my Trek Superfly Single Speed with a Niner rigid carbon fork. Wheels are custom. DT Swiss 240s on Stans 355 29er rims laced with DT Revolution spokes. These are light wheels that I use only on race day. They are a little flexy and require frequent truing touch-ups. The 400 gram Bontrager 29-0 Team Issue 1.9 tires bring the total weight of my ride to 16.5 lbs. I don’t think my bike will be holding me back today. Instead of the gearing proclamation in my Vaguely-Southern-Cross-Related-Questions-With-Single-Speeder-Roger-Masse Cyclingdirt.com pre-race interview by Thom Parsons, this is a climbing race, so I’m running 34×20, not 36×17. Since I’ve been radio silent since Iron Cross in Oct of last year, I should catch you up on my sponsor situation. My team from last year, the Trek 29er Crew, is no more. Among the goals of the team was to raise awareness in the mountain bike community about the advantages of 29er mountain bikes through racing exposure. 29ers are so ubiquitous now, I’d say mission accomplished. Trek has been good to me over the years so I still want to ride for them. The mid-atlantic regional Trek rep, my Trek contact, Jon Rogers, stepped up to support me for the 2012 racing season as a free agent. So I’m psyched to be riding and racing Trek and Bontrager again this year! I drove the ten hours to the race venue at the Montaluce Winery in Dahlonaga GA with my frequent travel partner, Team CF rider, Cheryl Sornson. By the 10am race start, it’s sunny and the temps are in the 40s, rising to the mid 50s by early afternoon… not bad for February. We line up for a mass start with 300 riders. Other than DC local Chris Merriam, I’m not really familiar with the capabilities of any of the 30 riders entered in the single speed. After my win at Iron Cross 3 months earlier, I’m liking my chances for a top-3 finish… but surely, there will be challengers. I line up early and secure a front row spot next to Ernesto Marenchin and Salsa rider Gerry Pflug, both of whom are riding gears. Bang! We’re off down the pavement and dive into grass in what is a traditional taped off cyclocross course. I’m spun out quick and the fast geared riders start to trickle past. Down the first descent I’m on Ernesto’s wheel. I have to swerve slightly to avoid a bottle that just ejected from his bike. Soon we’re back on pavement at the base of the first run-up. The top geared riders are all on their bikes in front of me. I’m determined to ride it as well. It’s a maximal effort, but I manage to stay on my bike to the top. My heart rate is really high. Cross course done, we head out of the winery down a slight descent. I’m under-geared in this situation and trying to recover. Geared riders are trickling past again. Six miles and 20 minutes later, I’m still going backwards. I’m feeling like I burned too many matches in the start. The road is gravel now and we’re on the small rollers before the first climb. Cheryl rides by in the lead for the woman. She has a small gap on 4 chasers in her category lead by her teammate Selene Yeager. As they all go by, I manage to catch the back-end of their train. Moments later the woman right in front of me is fishtailing on loose gravel. As I go wide left to clear her, she goes down just as she seems to regain control of her speed. As a fairly low speed crash, I feel confident she’s ok. I don’t stop for her, despite a short internal debate with myself considering what to do. Soon I overtake the woman chasers and give some words of encouragement to Selene. She’s breathing heavily. I’m know I’m already several minutes behind the geared leaders when I see Garth Prosser just completing the repair for his first of several flats. That had to take at least 3 minutes. I’ve got my work cut out for me. A total of at least 4 single speeders had slipped by me on the faster sections. My friend from DC, Chris Merriam catches me. We ride together for a bit chatting, but he too starts to slip away as we start climbing. The first climb is really only two miles, but it goes up over 2000 feet in elevation in that distance. Soon my 34×20 is starting to feel like the right choice. I start to pull riders back and soon catch and pass Chris. Another couple of single speeders are caught and passed shortly after. Right at the top, I catch the 1st and 2nd place single speeders, Chip Meek and Brian Patton. All of a sudden, I’m back in it! We’re all together at the top. As we finish the climb and start the rollers through mile 16 and start descent down the other side, I become aware of a couple of things: Chip seems a little bit better on the descents and Brian seems to be a little bit stronger on the climbs. I also realize, I’ve ridden right by the aid station without getting a bottle… not good. Most of the descent, I follow Chip, maybe 20 feet back. This is high speed descending fun. We are flying. By the bottom, we had dropped Brian. He couldn’t have been too far back, because within the next mile or so, he’s back on and we three are together again. The second climb gains perhaps 1100 feet, but this time, it’s over the course of 10 miles. My gearing for much of this is perfect. I’m able to remain seated and I’m feeling pretty good. Chip leads for the first few miles with Brian and I on his wheel. About half way up, Brain takes over and cranks up the effort a fair bit. He’s really strong and I’m happy to just sit on his wheel. After a mile or so, I see that Chip is falling back. With maybe a mile to go to the top, Brain pulls off as if he wanted me to take a turn. I complement him on the pace making. I take over on the front assuming the same pace as he is reaching in his pockets for food. After several minutes, I’m surprised to realize that Brain is gapped as well. I would learn later that he was bonking. With only a small bit of climbing left, I put down a slightly higher effort to try and increase my advantage. This is it. Now or never. By the top of the second climb, they are out of sight, but probably less than a minute or two back. I’m down to 1/3 of a bottle, but I decide to gamble and blow by the 2nd aid station. My lead is tenuous, the rest of the race is mostly descending and It’s really not that hot. I descend aggressively, trying to milk my lead which I know will be cut down once we get on the flat rolling pavement back to the winery. I pass several geared riders going downhill. Most of them pass me back once we get on the pavement. I keep thinking one of them is going to be Chip or Brian. So far so good… but it’s still several miles back to the winery. I’m running scared. As I turn into the winery, and approach the second run-up, I’m able to catch two geared riders that passed me on the road. We’re all together at the top. I have to emergency swerve left for the second time today to avoid one of them who goes down in the grass right in front of me. With less than a mile of riding left, we’re treated to some new cross course that includes two little stream crossings. It was erected in secret while we were in the mountains. Tricky! I cross the line in 3:28, just one minute ahead of Brian who was only 15 seconds in front of Chip. That was close! Thom Parsons immediately comes over for a post race interview. I was still breathing hard and wasn’t even sure I’d won at that point. In the other categories, the super-fast Thomas Turner from the Jamis Factory team took the win overall at just over 3 hours. My fast friend Gerry Pflug won the 40+ category in 3:20. Finally, Cheryl won the woman convincingly at 3:34. Full results here. Congrats to all of you. …and to everyone else who was brave enough to test their fitness in February! 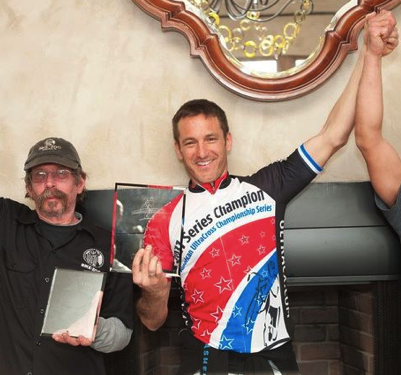 My win here at Southern Cross was enough to win the coveted American UltraCross Series Jersey for the 2011 series. Sweet! If you’re looking for fast gravel road racing, consider doing Hilly Billy Roubaix, my next UltraCross Series stop. This entry was posted on March 3, 2012 at 9:03 pm and is filed under Cross, Must do Races. You can follow any responses to this entry through the RSS 2.0 feed. You can leave a response, or trackback from your own site. I was worried about the same thing. At the time I also had a geared Superfly with the 51mm offset fox fork. I really liked the Niner rigid both in having about the right amount of offset and for being somewhat compliant for a rigid. Best way to find out if Trek/Bontrager makes something is to ask you local Trek dealer shop. They have much better access to Trek’s inventory as a dealer as we the public do. Also, if they are being sold on Trek bikes for 2015, it shouldn’t be too long before used parts start showing up on eBay. Good luck! Hi Roger, thanks for a quick response. So at this point without knowing when/if Trek will make the new rigid carbon fork from their Superfly SS available or not, can you tell me more about how the Niner fork worked with your SS bike? I also realize this article is a bit dated so perhaps you could talk more about what types of rigid setups you may (or may not) be using currently.